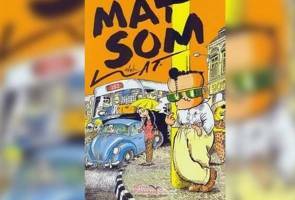 RIYADH: After nearly 30 years, 'Mat Som', the cartoon book of the famous Malaysian cartoonist Datuk Mohammad Nor Khalid or popularly known as Lat, will have its sequel, Mat Som 2, published this year. Lat, 66, said it took him a long time to complete the graphic novel as he wanted to produce the best after the first one published in 1989. ""This work will illustrate the lives of young people in Kuala Lumpur today, who have been complaining about the hardships that we have actually faced before." He said this to reporters during the special session to introduce 'Tifl al-Qaryah', the Arabic version of his popular cartoon book, Kampung Boy, at the Riyadh International Book Fair (RIBF) 2017 here on Wednesday. The classic book, Mat Som, captures the dilemma in the life of a part-time writer named Mat Som Mat Top in the capital city. It was adapted into a film titled 'Mat Som', starring Imuda in 1990. At the same time, Lat said the Arabic version of Kampung Boy was well received by cartoon art enthusiasts in Saudi Arabia and the books sold out quickly at the book fair. "Readers among the Arab community will now know about the life of Muslims in Malaysia, which is actually not much different as I also highlighted the traditional way of life of the Malays which also linked to Islamic laws," he said.